A great way to make your search ads more fluid and user-friendly is by adding sitelink extensions to your campaign. Sitelink extensions will allow you to enter a link to different pages on your website that users may have trouble finding when they are directed to your landing page. For example, you can add a link to your menu if you own a restaurant. This way, customers can easily find what they need at the click of a button. The Sitelink Extensions Upload Template allows you to store and edit multiple sitelinks for all your ad groups and campaign to quickly upload them when you need to implement change. Download this free template to get started. You’ll start your journey by entering the specific action you want to take with your sitelink extension. You can choose to add or remove a sitelink to your as group. Write the action you want to take under the Action column. Next, enter the campaign you want to designate your sitelink edit to in column B. 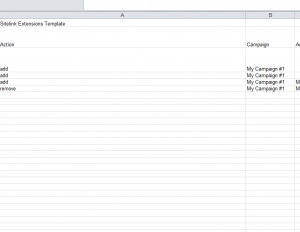 You will do the same in column C, by specifying which ad group you want to use within your selected campaign. The Sitelink Text column is where you will write the text that will appear in your ad for your customers to click. If you’re directing them to your restaurant’s menu, the phrase “Menu Items” would be a clear and concise way of letting your customer know that the link will lead to your menu. With your sitelink text up and ready to go, it’s time to give it an actual link to send your customers to a designated page. Using the previous example for a restaurant, you will enter the URL of the menu page you want your customers to be directed to in the Final URL column. Similarly, in column F, you can add a separate URL for your mobile as well. If you want to receive information about your source clicks that AdWords may not offer, you can also add Tracking and Custom Parameter templates into the appropriate columns to receive valuable feedback on your ad clicks. Finally, the Description columns are completely optional sections to add additional text that describes what your customers will find when they click your sitelink. This is recommended if your sitelink text is vague or your need that space to mention something else about the link. After you’ve completed all the items required for the Sitelink Extensions Upload Template, just upload this document to your AdWords campaign.